The Vickers Vildebeest and the similar Vickers Vincent were two very large two- to three-seat single-engine British biplanes designed and built by Vickers and used as a light bomber, torpedo bomber and in the army cooperation roles. While first flown in 1928, it remained in service at the start of the Second World War, with the last Vildebeests flying against Japanese forces over Singapore and Java in 1942. Designed against Air Ministry Specification 24/25 for the RAF, for a land-based torpedo bomber to replace the Hawker Horsley, the prototype Vildebeest, the Vickers Type 132, was first flown in April 1928, powered by a Bristol Jupiter VIII radial engine. After initial evaluation, the Vildebeest was shortlisted for evaluation with the Blackburn Beagle and Handley Page Hare. As the Jupiter VIII was prone to vibration, a second prototype, the Vickers Type 204 was fitted with a Armstrong Siddeley Panther engine, and after further testing, the Vickers design was confirmed as the winner of the contest. Engines problems continued, however, which were solved by fitting a new version of the Jupiter, which later became known as the Bristol Pegasus. 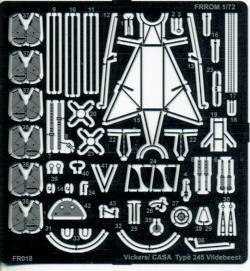 The Vildebeest had an all-metal, fabric-covered airframe, with single-bay unstaggered wings. An initial production order was placed in 1931 for nine aircraft, with the first production aircraft flying in September 1932. More production followed, with major production being of the Vildebeest III version, which added a third crewmember, with 150 built for the RAF. The Mark IV introduced the much more powerful (825 hp (615 kW)) Bristol Perseus Sleeve valve radial engine enclosed in a NACA cowling, which significantly improved performance, maximum speed increasing to 156 mph (251 km/h) and rate of climb to 840 ft/min (4.3 m/s). The Perseus had overheating problems, and was unsuitable for tropical service, and production was limited to 18 aircraft, which served with the home based squadrons. As with may aircraft designs during the mid war period, the Vildebeest was exported and build under license. One of the licensees was CASA in Spain who built a modified version powered by a Hispano-Suiza V-12 water-cooled engine. A total of 25 were built in Spain with two additional being supplied as knock-down aircraft from the UK. These were all operated by the Spanish Navy and were designed to be used as torpedo bombers. However, as often happens, they were adapted for land bombing as well. They could be operated either on wheels or on floats. Because of their water operation, they had larger rudders from the British Vildebeest. It is not surprising to see multiple boxings of this kit and this one's in-line engine makes the aircraft seem more graceful than the radial engine version. Most of the kit is molded in a nicely done grey plastic. Detailing is excellent and I found no molding glitches on any of the parts. Resin is used for the engine, control stick, rudder pedals and a few other items. The verywell done photo etch fret is for things like the seat harnesses, tail plane struts, some gun bits and quite a few items for the torpedo and the flight control actuating rods and levers. 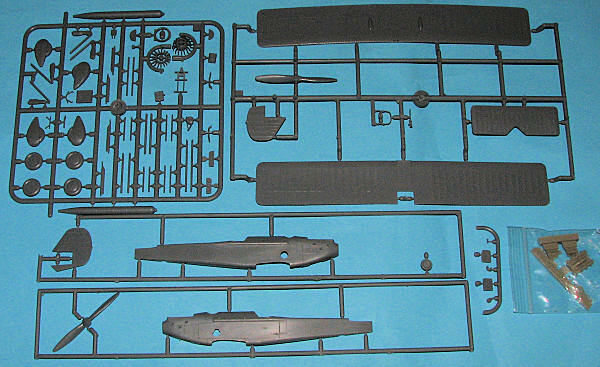 The inside of the fuselage halves are well detailed with framework representations. When done, the cockpit and gunner's positions will also be very nicely detailed, though there won't be a ton than can be seen through the rather small openings. Still, it is nice to know that all that framing is provided for the penlight crowd. The major difference between this kit and the one previewed earlier is due to the different engine. The resin engine section is the upper portion of the Hispano V-12 and there are under wing radiators that have to be added as well. There is a different prop and rudder, and of course, the fuselage halves are different. I have to admit I am glad that Azur decided to mold entire new fuselage sections rather than have us cut off the old nose and graft on a new one. The aircraft isn't as rigging intensive as one would initially believe. The instructions provide an excellent rigging diagram to help make things easy for the builder. Markings are given for five aircraft, all of them with a base color of aluminum dope. The first option is the box art option of T-5 when fighing on the Aragon front. It has large red panels on the wings and around the rear fuselage. T-23 has smaller red wing bands witn no upper wing roundels and heavy mottling in dark green and ochre. T-9 has a much larger red fuselage band , but it otherwise similar to the initial offering. T-1 is in the initial delivery scheme with no red bands. Finally BR-60 has the entire upper surface and sides painted dark green. Wing bands are on the wing tips and there is a fuselage band. No roundels and the underside is aluminum dope. Decals are superbly done by DEAD Design. Color references by Gunze. 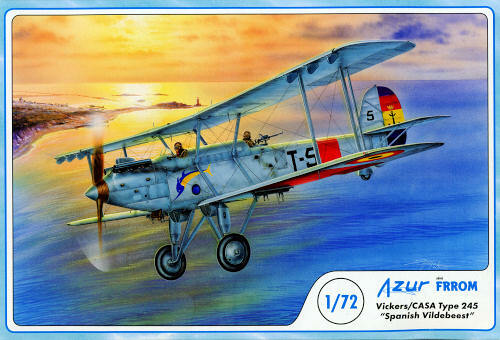 This is another very interesting between the wars type that any enthusiast who likes biplanes or aircraft of the Spanish Civil War should add to their collection. Thanks to www.westcoasthobbys.com for the preview kit. Get yours today from the link.